REPORTER FILE PHOTO Shelter Island Senior Center Director Laurie Fanelli has noted that there is a an “election stress disorder” that is plaguing some senior citizens. By now we are all used to the animosity that’s been part of the primary debates and the presidential candidate debates. Everyone appears to be as nasty as possible. And this negativity can cause great stress among voters, particularly seniors. AMBROSE CLANCY PHOTO | Deer in a Silver Beach backyard. AMBROSE CLANCY PHOTO | Anthony DeNicola speaking in East Hampton last week on successful programs he’s run on deer sterilization. There are people going out into the woods, often at night, capturing deer, bringing them back to makeshift operating rooms in garages and performing surgery on them. Sounds spooky, but this has nothing to do with Satanism or flipped-out thrill seekers. It’s a program to reduce deer herds by sterilizing does. The methods described above have been used by a Connecticut-based wildlife biologist, Anthony DeNicola, Ph.D., in places as diverse as San Jose, California, near Milwaukee, Wisconsin and in Cayuga Heights, New York. In that upstate New York village, 95 percent of does in the herd were captured, tranquilized and had their ovaries removed before being taken back to where they had been caught. Deer present what State Senator Ken Lavalle (R-Port Jefferson) termed recently “a health crisis on two fronts,” referring to tick-borne illnesses and injuries resulting from motorists striking deer. With scientific results taken from the Mashomack Preserve revealing a certain kind of tick was up 200 percent over last year and Southampton Hospital reporting Lyme disease cases spiking last month over June 2012 cases, it’s no wonder that Supervisor Jim Dougherty called the situation a ”health emergency” at Tuesday’s Town Board work session. The sterilization method is beginning to open some eyes as a solution to reducing the number of deer, who not only spread ticks and cause car crashes, but also destroy habitat and people’s property. Mr. DeNicola, founder of White Buffalo, a Connecticut-based non-profit, has worked on reducing deer herds with nonlethal methods since 1991, including non-fertility drugs. Vaccines producing anti-conception agents in female deer have improved from having to inject a deer every year to every three years. But that still means, since deer live up to 15 years, going out and capturing a single deer and injecting it three or four times at a minimum throughout its life. “That’s shoveling against the tide,” Mr. DeNicola said. With sterilization, it’s a onetime encounter. Within seven to 10 years, with a majority of does sterilized, herds will be reduced dramatically, Mr. DeNicola said. 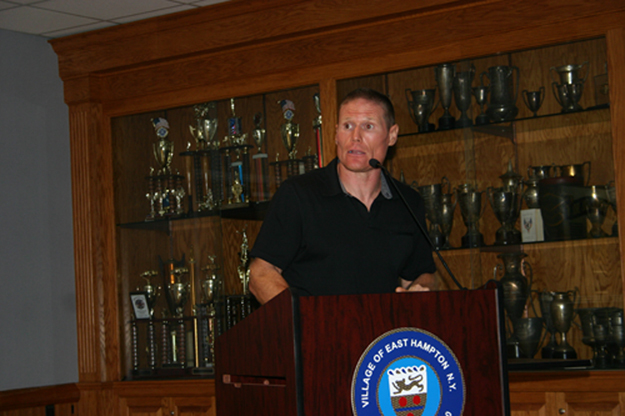 Speaking to a meeting of the Village Preservation Society of East Hampton last week, he described the sterilization techniques used in several communities across the country. Areas are baited with corn and apples under drop nets Mr. DeNicola described as “a large party tent with a soccer net on top.” When the animals are familiar with the feeding grounds, the nets are dropped by remote control. An immobilizing agent is administered to the deer, they’re taken out on stretchers to pickup trucks and driven no more than five minutes away to municipal facilities or even garages. Vets prep an area of the belly, a small incision is made, the ovaries removed and the wound stitched up. They’re monitored at the place where they were captured until they revive and then they’re free. The whole process start to finish takes under three hours. The surgery itself, performed by veterinarians, takes from 10 to 15 minutes. The cost: About $1,000 per deer if done by professionals or about $500 when done by trained volunteers. The majority of the cost is paid by grants from organizations such as the Humane Society and other nonprofits. “Instead of going back to deer over and over for infertility treatments, we’re done and it’s 100 percent effective,” Mr. DeNicola said. The numbers alone, Mr. Scheibel added, from Mr. DeNicola’s project in Cayuga Heights were eye opening, with 137 does sterilized over a two-week period, or a 95 percent capture rate. According to Joshua Stiller, wildlife biologist with the DEC, the primary method sanctioned by the state agency to reduce deer population is recreational hunting. There are methods to help communities overrun with deer by allowing special permits, also known as nuisance licenses, issued by the DEC to individual farm owners, for example, or municipalities, who can then designate an agent to hunt outside the general hunting season. Sterilization or administering birth control are allowed by the DEC on an experiential basis if a research component is part of the program. One of several problems associated with hunting, and with nuisance licenses, cropped up here when it was revealed that culling the Island’s herd has fallen off dramatically. Police Chief James Read reported to the Town Board recently that in 2006, when nuisance hunting kicked off, 478 deer were taken. But that became a steady decline over the years with 222 deer killed last year. The number of nuisance hunters on the Island who have taken at least one deer has gone from 24 in 2006 to only seven last year. Mr. Scheibel noted that six of the seven nuisance hunters registered last year took only two deer each, for a total of 12, while the other hunter killed the rest of the 222. At Tuesday’s Town Board work session, Supervisor Jim Dougherty reported that he and Chief Read had been in touch with the hunter, Ray Bouissey, who is spending the summer in Wyoming. “He’s coming back in October and we’re working very hard on getting the nuisance hunt going,” Mr. Dougherty said. Chief Read told the board he would be holding a meeting in a month or so with other hunters to discuss the nuisance hunt program. As for the idea of sterilization to reduce the herd and eradicate ticks, Chairman Patricia Shillingburg of the town’s Deer and Tick Committee, while admitting, “I’m no scientist,” thought sterilization “is a brilliant idea,” especially with fewer and fewer people hunting.